Surprise, surprise! We can study this ancient epic from both a historical--Gilgamesh was a historical figure--and a literary point-of-view. An aside: I still find it amazing that someone ever figured out how to read this cuneiform! 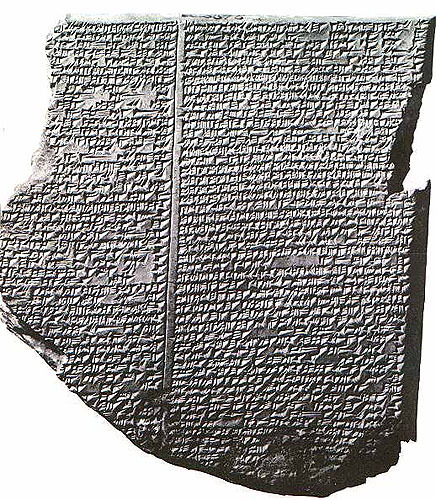 The tablets were originally found by British archaeologist Austen Henry Layard in 1849 and now reside in the British Museum, which has some good online information about the Gilgamesh tablets. Read Gilgamesh (in its entirety). Citing specific evidence from Gilgamesh (not from the textbook), explain the role(s) of kingship in ancient Sumerian society. In other words, one might ask, what were the duties of the king or what was a Sumerian king expected to do or what were some of the characteristics of kingship in Ancient Mesopotamia? Before proceeding, you might wish to read the short notes and review the study questions on Gilgamesh. Professor Romeo also has some ideas for those of you who are having trouble with this assignment. You can also check out our short video on this assignment. You may consider submitting drafts of your assignment to your instructor for feedback before submitting the assignment for a grade. At times, you may be asked to rewrite your essay before it is graded. This is done for your own benefit and will result in an improved grade. Please take a moment to review Charlie's History Writing Center for specific information on the writing requirements for the assignments in the course. Please check this short explanation of what it means to cite historical evidence. Your assignment should be submitted on Blackboard.